Porter Airlines is a regional carrier based in Toronto. 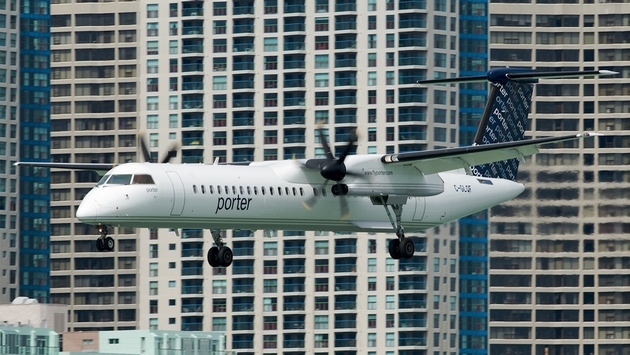 It flies out of Billy Bishop Airport instead of the larger Pearson International, so even people who have flown into Toronto numerous times might not be familiar with Porter. Over the past two years, this upstart airline has earned very high praises from the travel industry. Both the World Airline Awards, which are based on annual passenger surveys conducted by Skytrax, and Conde Nast Traveler have given Porter high marks for its service. Last month Skytrax named it the best regional airline in North America. Conde Nast went a step further, dubbing Porter the top regional airline in the world. These awards are even more impressive when you consider the fact that Porter’s fleet consists of Canadian-made Bombardier Q400s (also known as Dash 8s). Plane-spotters will know that the Q400 is not a jet aircraft, but a large turboprop plane that can carry between 70 and 80 passengers. The airline does not really need jets to fly its routes. All of the Canadian cities that Porter serves directly are in the eastern half of the country. Its regular U.S. destinations include Boston, Chicago and Washington, D.C. There are also seasonal routes to places like Myrtle Beach and Charleston, South Carolina. People might consider Porter a throwback airline because of its planes, but they could just as easily describe it as a retro airline because of some of the services it offers. People who flew when prop planes ruled the commercial airline industry, or even during the early days of the Jet Age, often get nostalgic. That was the era when flying was a special event. Passengers wore their best clothes, drinks and food were always served, and great in-flight service was expected (and usually received). Porter does not replicate the entire experience of those glory days, but it probably gets closer than most other airlines. Passengers who fly out of Billy Bishop are treated to something that is very rare in today’s air travel industry: complimentary food and beverages… before take-off. Everyone, not just premium class passengers, gets to wait for their flight in Porter’s lounge area. In addition to snacks and soft drinks, of-age fliers can grab a beer or a glass of wine. Free newspapers and wireless Internet are also on the menu. The largest of these lounges is at Bishop, but Porter passengers can enjoy similar services on a smaller scale at Newark and Ottawa International. The extra treats don’t disappear after takeoff. Snacks and beverages (including beer and wine) are offered in-flight for no additional charge. Porter’s extra pampering might make older passengers think that they have traveled back in time to flying’s heyday. The retro uniforms worn by Porter’s flight attendants further inspire this illusion. But not everything is perfect for Porter passengers. Like most major carriers, Porter charges for checked baggage ($25 for the first bag and $35 for the second). However, two carry-ons, at 20 pounds each, are allowed for every flier. Turboprops will continue to be a part of Porter’s line-up. The airline has an option with Bombardier for a number of “next generation” Q400s. The Canadian airplane manufacturer will also be supplying the airline with a game-changer: a dozen CS100 jets. Each of these can hold 25 to 30 more passengers than their prop-driven cousins. Porter’s recent accolades have shown that both passengers and the travel media respond to extra services and perks, and they appreciate any airline that can make flying feel like an fun event, not a chore.